The Icicle Works' frontman Ian McNabb sounds suspiciously like David Bowie in this track, 'Love is a wonderful colour'. Their first hit single, entering the UK singles chart on December 24, 1983, it was also their biggest, peaking at number 15 during a 9 week chart run. This 12" single features an extended remix of almost 7 minutes created by Hugh Jones. The two B-side tracks also appeared on a limited edition double single which I've written about almost three years ago. After the release of their self-titled debut album the Icicle Works struggled to match their initial commercial success. As a live band they did secure a loyal fan base in the UK and abroad. 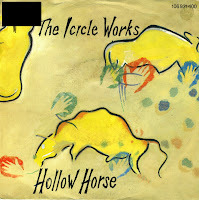 In September 1984 the band issued the single 'Hollow Horse', which continued to be a live favourite, but failed to reach the UK singles chart. I bought this single recently on the assumption that it would be an interesting song, because I knew the band. The song turns out to have the same soaring quality as 'Love is a wonderful colour', but is less memorable. Still, a very nice single. 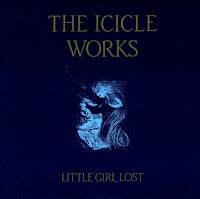 The Icicle Works released their fourth album 'Blind' in 1988. This contained the reggae-inspired track 'Little girl lost', a track I got to know thanks to a four track cd-single which also featured the earlier single 'Evangeline'. The Icicle Works never managed to get into the Dutch Top 40, and this single was no exception. I bought this single during a trip to London to see two live concerts on two nights: Black and All About Eve were both playing in the same week in that town. On the last day of my trip, I was hit by a kidney stone. What a memorable week. 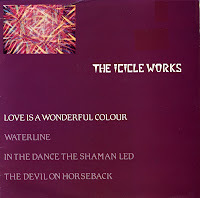 'Love is a wonderful colour' was the first single by the Icicle Works to reach the UK singles chart. The song is a dynamic piece of work, the vocals by lead singer Ian McNabb sounding suspiciously like David Bowie. I found the double single edition during my visit to Beanos in 2006. I'd never bought a double single this cheap before.